A close up of my favorite quilt that I think I've ever made but haven't shown you yet. Just seeing those stitches reminds me that you might be waiting for my quilt stitching post...still in the works. It's coming, promise. See parenthetical excuses above. I don't believe you've met Lemon the canary. He is our sweet, little, somewhat aloof, tweety bird who sings so beautifully. We adore him, but he is hard to get pictures of through that cage. Not new vases. But I like the way they are looking on a deep peacock blue wall that used to be pink. This is one of my new old paintings. I'll show you more soon. 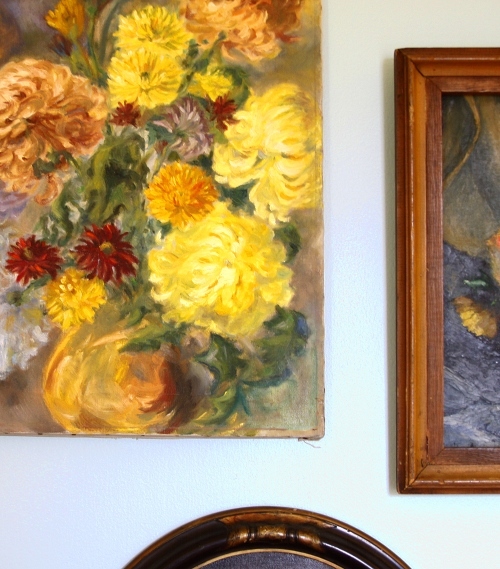 I bought this one and a few other florals simply because they remind me of the way my dad paints. 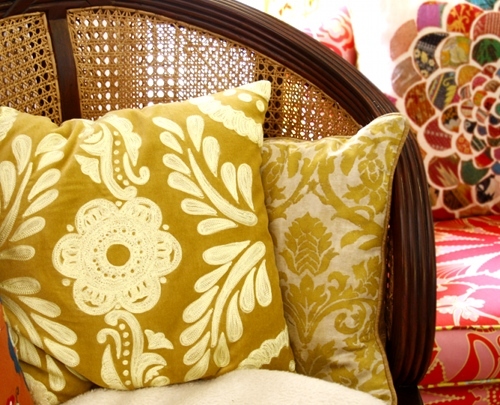 This is one of my new embroidered velvet pillows that I designed for Peking. Very cozy and a nice compliment to homesewn goods. This isn't another pet, but rather a shaggy soft pillow that I scored at anthro for 19.95 (was $98!) while there on an unrelated mission. Of course. I put my books in color order. I don't remember the couple of different sources that I've seen similar done, but have always loved the look of it. This is the yellow section. Not too many yellow books. Hmpf. OH! I think the spine of my new book is going to be yellow! I gotta check on that. Very important. Someone else who color codes their books - everyone looks at me as if I'm odd when they see my bookcase. With all the other work you are doing, I am AMAZED that you even found the time to get tulips! I am sure the dinner was lovely. Your book organization is a nice touch. I used to have a picture of a rainbow-organized library above my studio desk. It is a lovely way to organize. Such a cheery post! I agree with hopeyt, not sure how you even managed to buy the tulips!I love hearing canary song wafting through the house, though I don't have one at the moment. Brings back fond memories of childhood. Bet it will do that for your kids, too. Lovely yellow! Glad to hear you survived life as a single mom for a few days! I do that with my books too, although it does make finding books slightly complicated! Sunny days to you, too. Sounds like you've been a busy bee!! I love the colour yellow. I never wear it and I don't decorate a lot with it, because somehow yellow and I don't seem to go together well, but I still love it. Especially in pictures. Reminds me of the sun and summer. And I long for both! I can't believe that there are so many other people out there who colour code their books! I truly thought I was the only wacky who did this! Finding books is a real pain, but it looks sooo much better! yellow is my favorite color lately, i just can't get enough of it. whenever i think about the new clothes i'm going to sew, they come out yellow in my head. must be the color for this month. I love the books, now I know what I'll be spending part of the weekend doing. And the quilt...oh please show us! I recently moved one of our bookcases into the livingroom. The books I moved into that bookcase were chosen from the other bookcases to color coordinate with the livingroom. My husband thought I was nuts! Love all the bright spring time yellow! 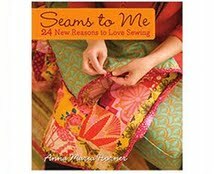 I purchased your book "Seams to Me" this week as a present to myself, lucky me! I did a similar post a few weeks ago. My physio therapist called optimism "looking for the yellow." I do it every day now. Thanks for another tour. My mother in law has a canary as well....the chirping is so lively! I would absolutely love to go shopping in NYC! Used to hate it. Now I can't seem to get enough of it! Fantastic images! The color-coordinated books put me in mind of a display we recently did at the library where I work. In the children's dept. we were looking for a new idea, and it was near St. Patrick's Day, so I said - how about a display of green colored books? We get lots of comments! 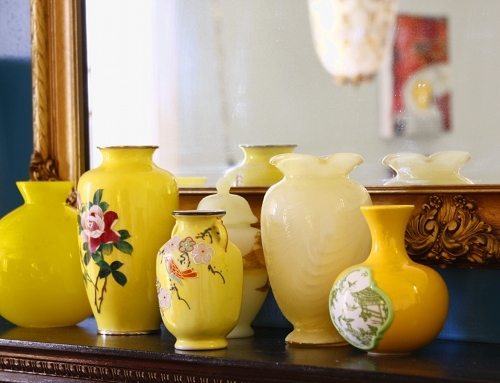 Your yellow vases are lovely. I don't know how you do it all! You simply amaze me sometimes. I think buying flowers is such a treat. 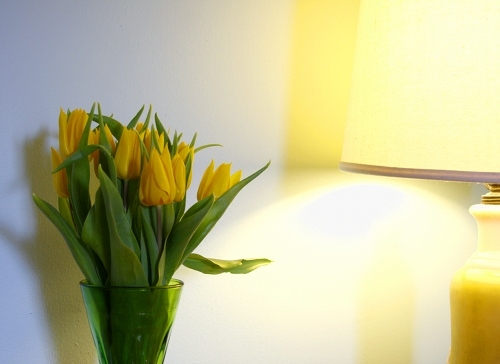 I always have fresh flowers in my guest room when we have a guest. Perfect end to a great Friday. I hope Sat reflects the hues of this post! Brilliant minds think alike! I posted yellow today too, as lemon meringue was on my mind. Love yellow. Its unassuming, but unabashedly chipper. Love yellow ~ the brighter the better. 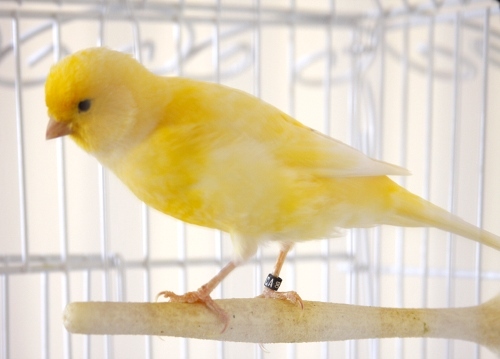 And the canary is just precious! Your last 2 posts are making me go pull out some yellow and orange fabrics I've had stashed for ahwhile. Thanks for the springy inspirations! All of it is so lovely. A wonderful way to start off my weekend. Thank you for all the beauty! Have a terrific weekend! Girl, "lazy" and you go together like Oprah Winfrey and diets; It may happen every other year or so, but it doesn't stick. B ooo ti ful! Love that yellow! I love the new pillows. The canary is so sweet. I think I would like to have a bird but we went to the pet store and bought two mice this weekend so the bird will have to wait. The mice are sure cute though. I was meaning to tell you that at our fantastic Powell's bookstore here (it is giant! ), there are only a couple of sewing books (among all of the many ones on the shelves) that I saw little cards that had written reccomendations on them and one was for your great book. My favorite color since I was a child! Thanks for the luscious yellow inspired photos. 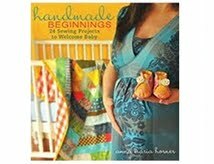 I was also happy to see Alicia Paulson's Stitched in Time book -it is one I love dearly. The photos are so great and colourful and make me want o jump into all that prettiness. 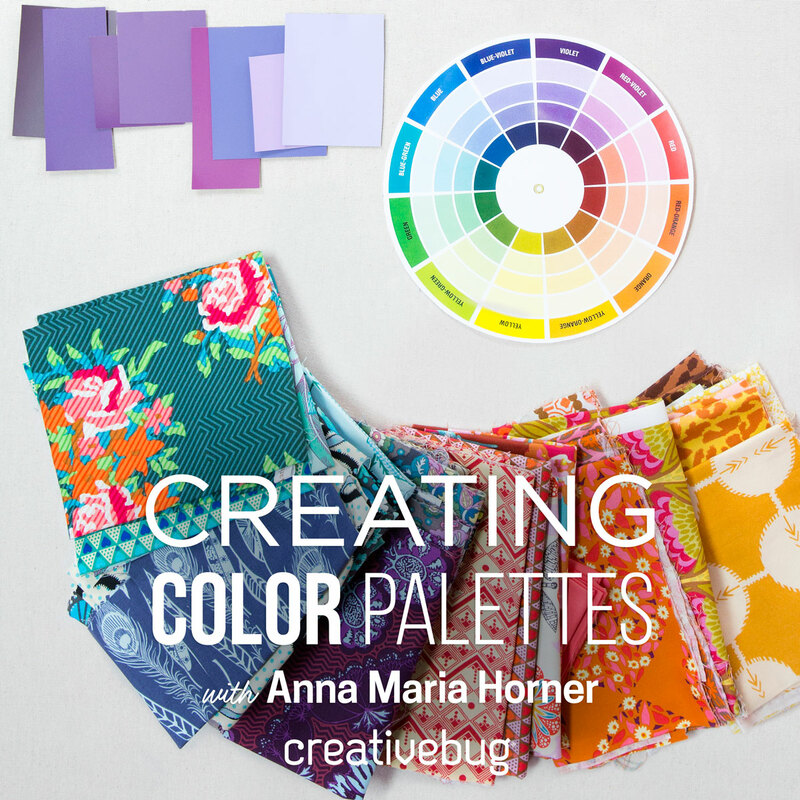 Thank you as always for your wonderful blog - it is filled with so much color and inspiration. I'm passing along the "Sunshine Award" to you. Simply lovely. It's rainy and dreary here, but your yellow has brightened my day indeed! Having a rainy day here and so I'm especially loving your yellow post. What a great way to sort your books. How fun! Ahhh that is so beautiful. I love yellow. 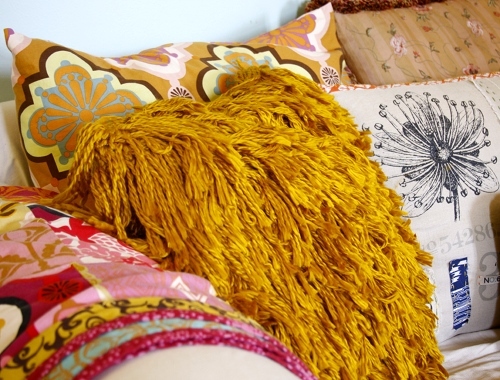 I just love color and I need more of it in my home because my home is so dull! Very inspiring. 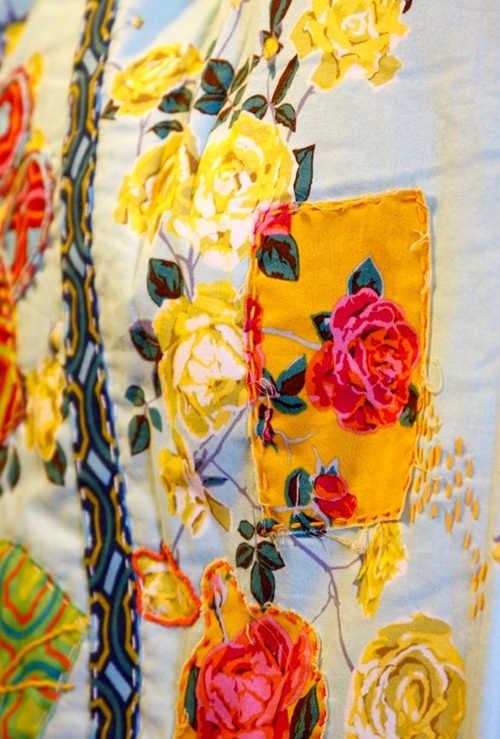 LOVE that hand stitched quilt that you're working on! And color-coded books? Are you my secret twin? I have mentioned this in my house. They laughed. So I think I will start with my own books first. The closeup of that quilt is making me twitchy to work on my own. If I could only get through the tax stuff...and off my blog list, of course. Lovely group of photos. May I please have your bird??? LOVE this post! It is absolute divine darling! Oh my! I find more and more in common with you. Too bad you are famous and have SO MANY that feel the same way. Haha! 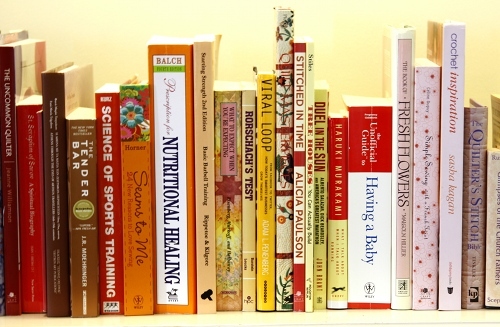 I Adore my "Nutritional Healing" book! It is just after the bible for "Most read" in this house. And it totally works. Thank God for wonderful people who do their homework and make life easier for us all. Say, during the flu season we have been using this stuff called "ACF". It is amazing. And works to ward off sickness by boosting the immune system. Maybe I should have called my blog "blah, blah, blah" since I tend to ramble. And full of colors all around happy floral colors , for us the yellow represent the high summer when the sun is very strong . Love your photos and yellow objects . 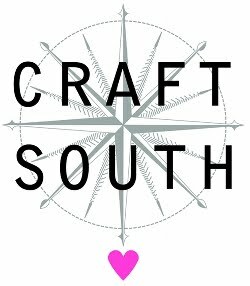 Just a quick line to let you know that I love your blog and that I linked it in a post about learning to quilt. Feel free to stop by and check it out! Thanks for all the great info here! love your blog! and have a huge crush on your fabrics!! we had our bookshelves color-coded for a while and you can get so much inspiration for that kind of thing in the flickr photo pools. but i am a trained librarian so eventually it drove me nuts while my graphic designer fiance was right in his element! I want to see more of your favorite quilt! And I love the yellow with peacock blue. My dining room/library is peacock blue and I have accents of what I call "marigold" in there (with some red and kelly green here and there, too--not as crazy as it sounds, it is actually peaceful). It's very beautiful. I'm a french painter. Come on to see my blog it's http://www.yagoa.fr/LeTrionnaireAtelier. I've seen some great photographs of colour coded book shelves, I think working with colour as the inspiration is fantastic. nice images.i like this.thnx my friend.